Swap Summon Skeletons for Vaal Summon Skeletons. 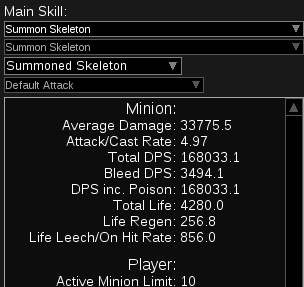 This is a Skeleton only build, I wanted to see what they're like in maps and endgame bossing. They're not as good as Specters or Flame Golems for clear, because their AI is still pretty dumb. But they're a lot stronger for bossing. It's slightly different than the recommended one because I have lots of Dex on gear and enough life to sacrifice a Ring. The heart of the build, I wouldn't replace it for anything in a skeleton build. The second heart of the build, huge survivability boost. Big damage boost and a higher chance for your minions to chill/freeze. Extremely important jewel to be able to summon skeletons quickly without running out of Mana. A few of these will give a big damage boost. Blind on hit halves monsters chance to hit, with one of these jewels it has 100% uptime on bosses. Taunt on hit means less targeting and less damage on you. Try to get the last 2 jewels with a "Minion damage if you used a minion skill recently" mod, and preferrably life, although all 3 mods can get expensive. Note that only one of each of the abyss jewels is needed. Nothing complicated here, you really only need to worry about this in a few specific fights, like Acid Lakes boss, Uber Trio, Minotaur and a couple of others. Just make sure he's attached to a minion life gem, sufficiently leveled and has all his regen gear (another reason to use femurs), A +2 helmet is nice to have, but not nessecery. If you notice him dropping below 50% HP at any point, unsocket the gem and resummon him when safe. This build can be done as a league starter with zero Budget. The only thing you need to get started is a 4-Link Femurs Staff, which costs 1 Chaos, and a From Dust jewel and work your way up from there. Swap Splash for Melee Physical Damage on high HP Bosses. -Bone Offering all the time, forget about flesh. -Max out their resists with 16% resist tree node and Commander of Darkness Ascendancy. -Use the staff for +2 levels. -Leech node and minion regen are somewhat helpful too. tl;dr SRS + Zombies until you get Bone Sculptor from Cruel Labyrinth, from that point you can drop everything else, switch to Skeleton Warriors and watch everything melt. Use only single curse Temporal Chains until red maps, more damage isn't needed before then. https://pathofexile.gamepedia.com/Violent_Dead For zombies to do damage. https://pathofexile.gamepedia.com/Bloodbond For Minion Survival and a nice HP boost. https://pathofexile.gamepedia.com/Redblade_Band For a fat golem that taunts things. https://pathofexile.gamepedia.com/Matua_Tupuna For an early +2 minions item. Any +2 Minion Helm for a +2 4-Link until you can equip Femurs. I would only consider a 1H + Shield setup on an ES based build. -Ability to wear Kaom's Heart, which pairs well with the high life regen from the tree. -Would need a significant and inefficient tree rework to grab Necromantic Aegis, and skeletons don't get maximum benefit from the charges because you'll constantly resummon them. You won't have enough mana to repeatedly cast Summon Skeletons, therefore https://pathofexile.gamepedia.com/From_Dust Jewel is critical to be able to run this build on very little available Mana/Regen. Don't level clarity at all, it's only there for +20% resistance bonus in combination with Commander of Darkness. -Their high Mana cost doesn't jive with the high Mana reservation and low Mana regen of this build, meaning if they die during combat it requires turning off an aura and slowly waiting for the mana to regen for each zombie. -They can do more harm than good in Multi-Proj/Chain maps since they tend to conjugate around you, meanning a quick for them and possibly you. -Their Damage and Survivability drops drastically in high end content. I personally don't think they're needed, but they can help with clear since skeletons aren't the fastest clearing minions in the world with their dumb AI. is probably your best bet, you will likely have to buy level 19 gems and level them to 20 yourself since nobody uses or sells these. Note that mine is set up for Vanguards, not clear specters. Is it worth using? I say No. Gain a few Gem slots. Cons: Lose Blasphemy Temp Chains. Lose generosity on Hatred (Essence Worm). Lose a flask slot to a mana flask. The recommended gear isn't cheap, but it's also not that expensive compared to the power it gives. Fine to use in yellow maps/easy red maps, beyond that your skeletons will die too quicky without bone offering, which is also a great survival boost for you. 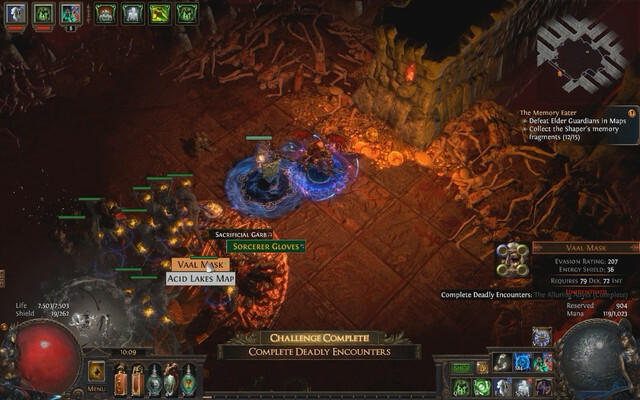 You can, if you plan on running easy maps, I would never swap it for high damage red maps or endgame bosses. They would need a significant HP boost (double), which is achievable through +1 gems +2 minion gems staff and a level 4 empower, then the fight is quite easy, I wouldn't attempt it with less than 8,000 HP Skeletons. Thanks for the guide. Going to give it a try mainly because I have all gear already. Great build, it's what I started this league with, has been fun so far ! Please add bandits in FAQ when you can. I tried playing a version of this build with Queen's escape, it is amazing but hard to reach late game maps because of the lack of suitability. Good point. Thank you for the reply. thanks for the post, and i wanna ask what should i use for my animated guardians? or i just missed? I'll add it to main post. nice build. I am trying to figure out how are you effectively proc-ing EE? Is it just by using ball lighting? Seems clunky no?